We created a legal advertising campaign which made Beswicks rise above competitors and attract more high profile clients. We were invited by the Beswicks’ marketing team to be included in their creative pitch and become a preferred supplier. 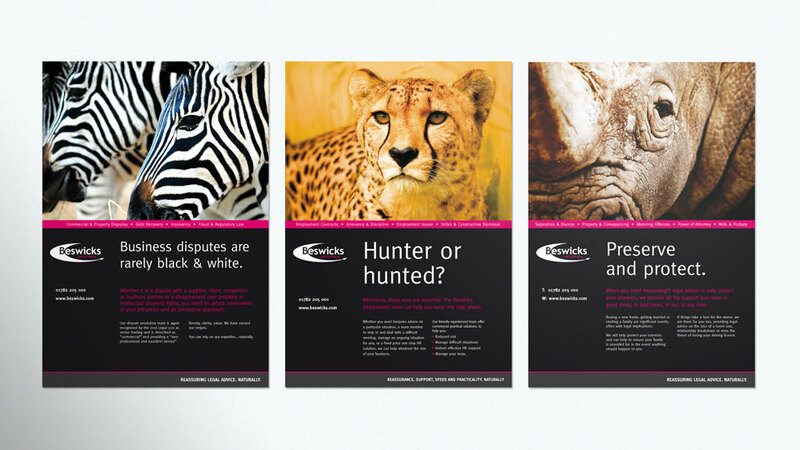 The brief was to create a legal advertising campaign which made Beswicks stand out from the rest of their competitors and also attract more high profile clients. Our first task was to acquire an in-depth understanding of each of the legal services and the reasons for the target audience to use these services. We also performed an audit of the client’s current brand which used nature themed images of landscapes and flora. We developed a series of adverts that captured the essence of each service with intriguing headlines and bold photography. The imagery for the concepts continued with the nature theme, but instead featured striking close-ups of wild beasts. When the client received our proposal they phoned us straight away to tell us that they were blown away with the concepts and could we start working on the rest of the campaign straight away. As a result of producing the successful legal advertising campaign for Beswicks they approached us soon afterwards to look at re-developing their existing brand identity.